Welcome to Harris-Stowe State University! I consider it an honor to join this renowned institution as its president. The St. Louis community and the Harris-Stowe Family have welcomed my family with open arms, and we are most grateful! Thank you to all the individuals who marked our beginnings with smiles and a Go Hornets spirit! 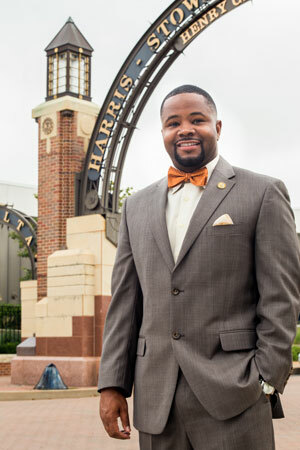 As we continue to celebrate Harris-Stowe’s unique and rich history, which spans 160 years, our vision is to become the best regional university in the nation that offers a standard of academic excellence while holistically developing and preparing our students for a global society. While tradition is embraced and respected, Harris-Stowe is moving forward by inspiring change to provide our students with current and future research opportunities, innovation, and overall academic excellence. As such, providing excellent student centered customer service will be at the core of what we do. In addition, our University faculty and staff are committed, dedicated, motivated and loyal to the HSSU brand. Several new and exciting opportunities await you as you begin your studies on campus this year. If you have not already made Harris-Stowe your choice, we encourage you to take a closer look, as it is our goal to make Harris-Stowe State University the “right choice” for every student. We want you to know that the administration, faculty, staff, and your fellow students will do all that we possibly can to make your experiences here both pleasant and rewarding. Do not hesitate to seek our help whenever you feel you need it. Again our warmest and sincerest welcome!